I’m spending money like a madman I tell ya. It’s been fairly cold here (in the teens most days) so acting on the advice of my Dad, I started feeding the pigs more grain to make sure they were getting enough calories to stay warm. This was going to be pretty expensive when they’re eating 2-3 times as much pelleted feed at $16.49 per bag. So it was time to go buy a cheaper source of calories. In the past few days as I’ve been fighting through all the paperwork that comes with starting up a farm, I did notice that agricultural equipment and feed is tax exempt in Minnesota. I paid sales taxes on all my feed purchases thus far, so I can file paperwork at the end of the year to get that credited back to me on the years tax bill. 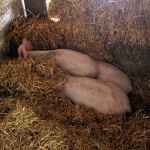 So how are the pigs eating on the shoestring budget I’ve given them? 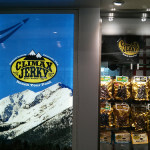 Quite well, thank you very much! 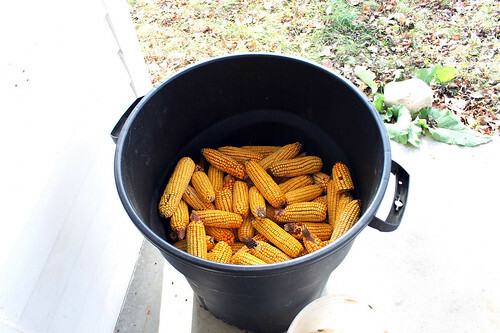 Remember back in October when I gleaned all that corn out of the fields after it had been harvested? I had enough to fill a 35 gallon trashcan, and after getting pigs, I wasn’t going to go wasting much of it on the squirrels. 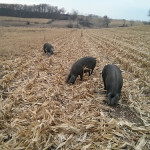 I tossed a few in with the pigs normal feed, but they seemed to prefer the normal feed, lazily chewing on the corn cobs once all the hog grower was gone. 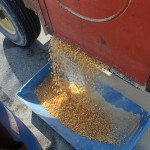 Also, feeding straight corn isn’t really ideal. 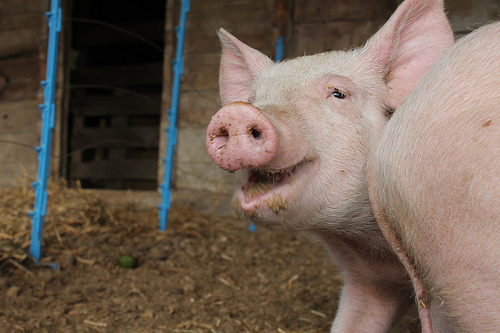 Pigs are supposed to get 14-17% protein in their diet. Corn is only around 9% protein. 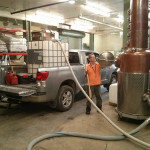 Plus, if it’s not ground up it is not as digestible. Enter my father, who used to raise hogs back in the day (before I was old enough to remember anything about it). He recommended soaking the corn in water for a few days. 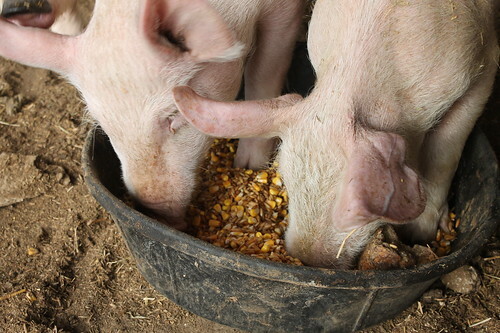 He even said that the hogs seemed to like taste of the corn more after it had been soaked. Sure enough, they seem to love some soaked corn. It even cuts down substantially on the amount of water they drink. Add in some higher protein whole oats (13% protein) and the pigs have a reasonably well balanced diet. They also get a bit of the bagged hog grower/finisher pellets and alfalfa mix hay. Variety, after all, covers a host of sins. 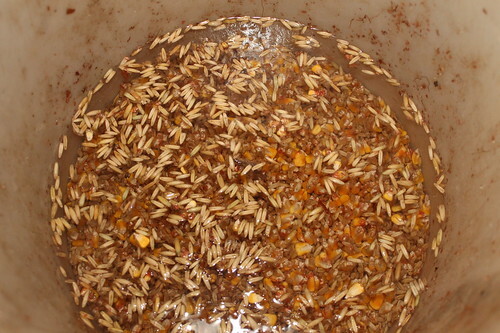 Start out with 2 pints shelled corn, and 2 pints whole oats, add water till it’s covered by an inch of extra H2O. 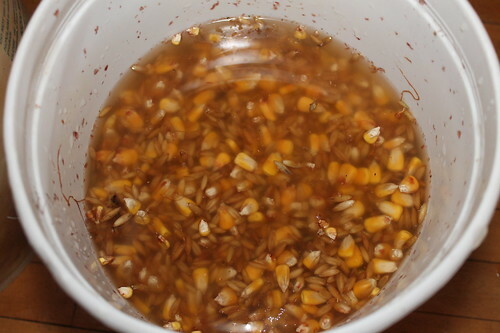 Then wait a day or two (or three), add water as necessary to keep the grain covered. After a few days, drain the excess water, and serve. 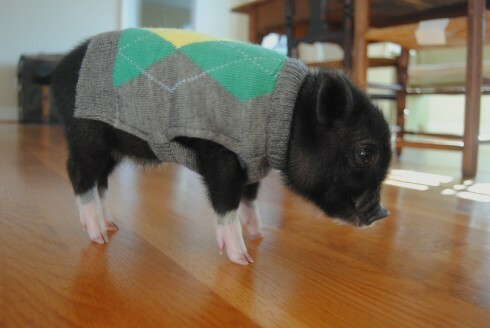 You should definitely make some pig coats. Gotta be chilly with so little hair.